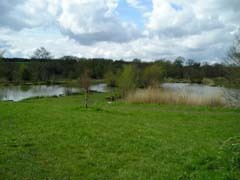 Blythe Waters offers five attractive lakes, plus a mile-long stretch of the River Blythe, set in pleasant, rolling countryside between the villages of Hampton in Arden and Knowle to the east of Solihull. 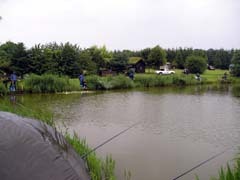 Established as a popular match venue, it is also well suited to pleasure anglers. It’s stocked with decent sized carp, bream, tench and roach, also perch, silver bream, gudgeon, golden orfe, daddy, ruffe, barbel and a few chub, there are no pike on any waters. 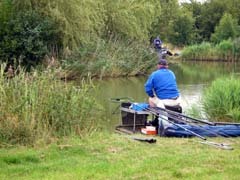 The fishery has good facilities for disabled anglers, particularly on Cherries Pool, which is next to the main car park and has large and even fishing platforms. This site is also very popular with family groups. In addition to the angling there are five touring caravan pitches. The site is available for caravan club members only. Next to the main car park is an unmistakable grass roofed club house. Open every day for the sale of day tickets, the club house also serves hot and cold food and drinks. In addition to the café area, the club house also offers toilets, including disabled toilets and shower facilities. Bridge and Willow pools are the main match pools on the site. Originally one pool, they are now separated. The waters are well stocked with small to medium sized fish with a few of the carp reaching upper double figures in weight. Expect match weights in the region of 80lb. All the pools are well established and mature in appearance with reed fringes and floating islands. Depths vary greatly around the pools, ranging from two feet in places down to 11 feet. 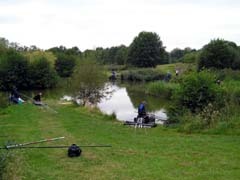 Cherries Pool is particularly popular with less able and junior anglers because of its large platforms and closeness to the main car park. The pool is fairly even in depths ranging from 4-5 feet. 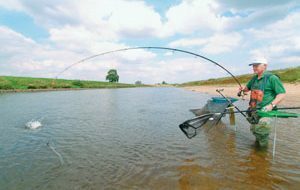 Along with large head of small carp and chub the pool boasts a large head of silver fish making it a very popular pool during the cooler months. Home Pool the largest pool on the site at three and a half acres and is 13 feet deep virtually all over. 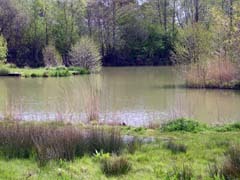 Originally an irrigation reservoir for the Christmas tree plantation, Home Pool is Blythe’s specimen venue and retirement pool for the carp that out grow the other pools. 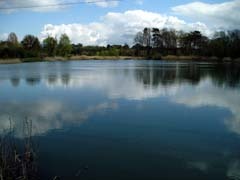 This pool has large stocks of upper double figure fish and over 20, 20lb+ fish. This pool is rod and line only due to the over head power cables the cross the pool. Standard specimen carp tactics score well, with simple rigs and good quality baits scoring the best. A night syndicate also operates on this pool. Kingfisher Pool is the newest pool on the site. Designed primarily with the novice angler in mind, this pool has high stocking densities of small fish. At times it a bite every time the bait hits the water. This makes this pool ideal for the beginner taking up the sport or younger angler, a venue where you’re virtually guaranteed to catch fish. Season Permit: British Waterways has introduced a season permit which covers all its commercial fisheries in the West Midlands business unit. These are Earlswood Lakes (Engine and Windmill pools only), Blythe Waters and Stockton Reservoir. 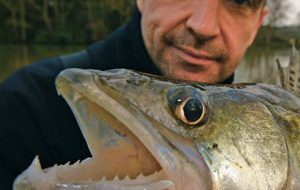 Full permit, which allow anglers to fish any day of the week, cost £156 a year and Concessions (subject to holding a concessionary rod licence) cost £130 a year. Matches: Regular open matches are held on Tuesday (evenings), Wednesdays and Saturdays.